Walk the red carpet at your favorite movie with these new LARGE popcorn tubs! 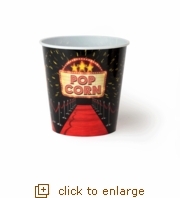 Each tub features eye catching graphics on a sleek black background with a red carpet leading to the POPCORN premiere. Durable plastic material means it is easy to enjoy your favorite popcorn snack time after time - tubs are reusable! Each jumbo tub has a 4-quart capacity so it holds just slightly less than a full batch of delicious Whirley-Pop popcorn!